I just got done with dinner and a beer after sitting in a field waiting for a buck dumb enough to stand in front of my rifle. I took a swing and a miss on a doe, but I’ve got 2 more days here in the valley to get it done. If all I do is fill my remaining B-tags, I’ll be happy. That’ll be six does in the freezer; almost an elk. It’s been a busy week in Helena. We’ve had a few thousand snow geese flying over town, headed for warmer climes. We’ve also seen the parade of ATV laden trucks headed either back home or into the field. We’ve also had our first closure of a Wolf Management Area. While I’m a little disappointed that I’ll have to travel an extra 20 miles to get to an open spot, I’m still pretty damned grateful that we have a season at all. I plan on spending a good portion of December and January chasing wolves. I’ve spent the last 9 years working on getting wolves delisted. Starting in Wyoming in 2002, and following through with the Simpson-Tester delisting rider of 2011, wolves have consumed a large part of my life. While the court battle still goes on, I’m confident that what we accomplished last spring will continue to hold. This means we’ll always have wolves, and we’re going to have to figure out how to manage them for their benefit, and ours. It doesn’t mean that we’re going to whack them down to 15 breeding pairs (150 wolves). That’s the minimum population allowed under the Endangered Species Act. If we try to manage a number that small, we’ll trigger a review from the US Fish and Wildlife Service, and wolves could be relisted, resulting in wasted time spent working on getting wolves delisted by thousands of Montanans who worked hard to get wolves delisted despite intense lobbying pressure from both the anti-wolf contingency and the pro-wolf contingency. Wolves have changed the way we hunt in the Northern Rockies. There is no doubt about that. Wolves have also had some pretty serious effects on ungulate populations in certain areas. Again, no doubt about that. How we as hunters and conservationists react to these new challenges is critical not only for the future of wolf management, but for the future of hunting. Hunters largely enjoy a positive image from the American people. In order to continue our passions and our outdoor heritage, we need to maintain that image. As we lose more hunters, we also lose the ability to connect with the non-hunting citizens in America. Our image as the stalwart conservationists must be maintained, and improved upon. Clamoring for the removal of wolves, and the imprisonment of government officials who were involved in the reintroduction of wolves, is a side show that does nothing to get us beyond the conflict.. Engaging with the Fish, Wildlife and Parks Department and Commission will. FWP does a fair job of managing critters and people. 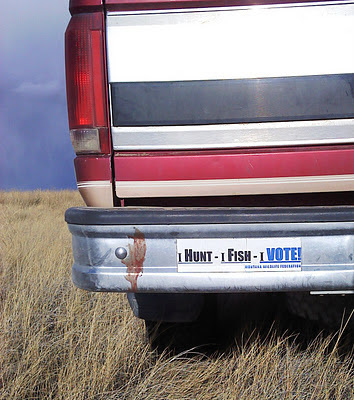 Montana has the most liberal hunting seasons in the west because FWP and Montanans focused on the one key issue that leads to abundant wildlife: maintaining habitat. Focusing on habitat connectivity and security gives us six weeks of archery hunting and five weeks of rifle hunting. That doesn’t even take in to account the early seasons we enjoy in the Bob Marshall and the Absorka-Beartooths. Right now, there are two proposals being put forward by FWP on wolves. One would extend the hunting season on wolves until January 31st, and the other would institute a method of utilizing hunters to help manage problem wolves when Wildlife Service’s can’t, or won’t, do the job. Montana Wildlife Federation worked with FWP to help develop this program, and while it may not be perfect, it’s pretty close. Comments are due by November 28th on both proposals, so sit your butts down, write a comment in support or in opposition, and let your voice be heard.